Amid the Brexit chaos, you would be forgiven if you’d forgotten that there will, at some stage in 2019, be a Spending Review. You would also be forgiven for forgetting about that time both Theresa May and Philip Hammond announced the end of austerity late last year. But few city leaders will have forgotten this promise. Having had to deal with falling budgets, they will no doubt be keen to ensure that they benefit from increased government spending. Sadly we can’t know what the end of austerity will really mean until the Spending Review takes place. Having said that, we can listen to what city leaders have identified as priorities, and draw conclusions about where cash injections might be most welcome. Where and how are cities feeling the pinch? 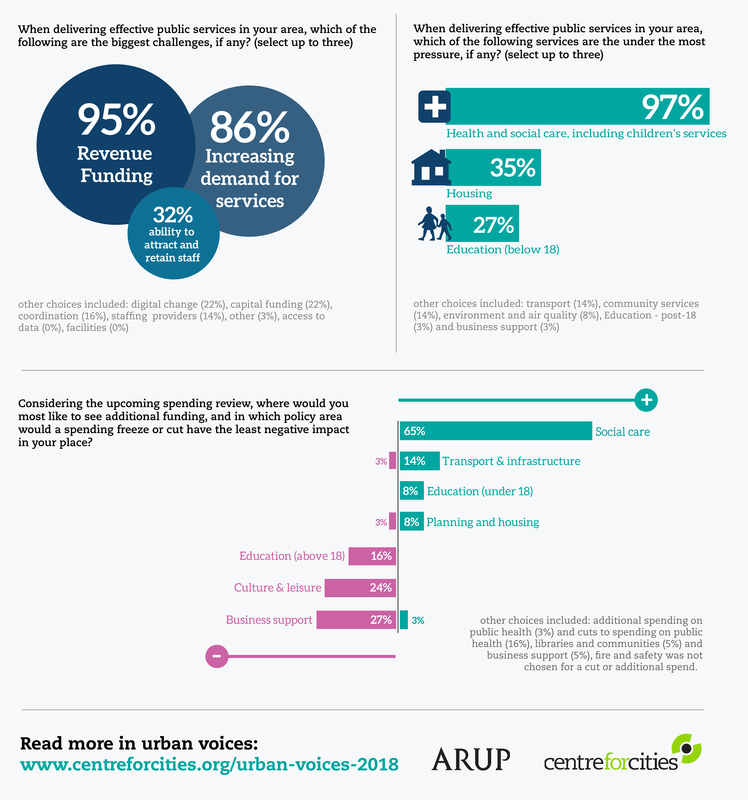 Our recent survey of city leaders, produced in partnership with Arup, made one thing abundantly clear: city leaders that responded to our survey are collectively feeling the pinch. When asked about the biggest challenges to public service delivery, 95% of leaders selected revenue funding as one of their main concerns, followed by 86% for increasing demand for services. It is hardly surprising that almost every leader that responded to the survey chose to highlight revenue funding as a particular challenge for delivering services. Put together with an increase in demand, you can begin to guess exactly where the pressures are building and what places should be given a cash injection in the Spending Review. In case you can’t guess, take a look at the top right of the above graphic – social care is the service that leaders overwhelmingly chose as under the most pressure. And just to labour the point a bit more, when asked what the one thing was city leaders would increase spending on, two-thirds opted for social care – choosing this over any increases to their education, transport or housing budgets. During the coalition years, spending was reduced across departments and it became increasingly clear that a lot of this was shouldered by local government. When making difficult decisions about how cuts play out in cities, city leaders have needed to protect statutory services such as social care. In doing this they have been less able to focus their priorities and funds on long term economic development through improvements to areas such as housing, education and transport. However, this does not mean that these areas do not matter to them. In fact, unprompted, they responded with these sorts of issues as top priorities; instead it just shows that ultimately there are real and fundamental pressures, such as social care, that cannot take a back seat. In spite of, or perhaps because of Brexit, city leaders need to be able to address these challenges and exploit the opportunities that come with developing their economies. This should be top of mind for ministers. We’ll have plenty more to say on this next week when we publish Cities Outlook 2019.